In January, the year 2008 was "looking rosy," according to Colusa County farmer Ben Carter. And then the hammer of rising fuel costs hit California farmers. 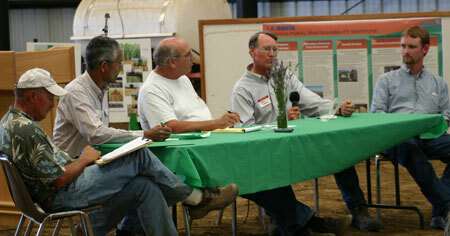 Carter pointed to soaring energy costs as the main culprit in the year’s shift to a less optimist outlook for farmers, a sentiment echoed by three others on the grower panel at the UC Davis Russell Ranch Sustainable Agriculture Facility’s June 2008 field day. The panel is a key feature of the annual Sustainable Agriculture Farming Systems (SAFS) project event, which showcases sustainable research and management practices. For the last two years, rising energy costs have been the panel’s center of attention. This year, farmers talked about how they’ve tried to stay economically sustainable in spite of on-farm energy cost increases. Their solutions ranged from doing their own marketing to using crop residue as an energy source. Carter is a third generation grower who farms 3,000 acres with his family at BenDen Farms in Colusa County. Their diversified operation includes 25 crops—field crops, row crops, orchards, and livestock—with two-thirds farmed conventionally and one-third farmed organically. Last year he told the field day audience that he was investigating the use of solar energy to power a 50 horsepower well, but the capital cost was too high. Instead, he saved money by doing pump tests to make sure they were efficient and used off-peak electricity for irrigation. He has three water recirculation systems that are very energy efficient. Thaddeus Barsotti of Capay Valley manages his farming business with his three brothers. The farm, Capay Organic, was started by his parents, Kathleen Barsotti and Martin Barnes. Their Community Supported Agriculture (CSA) project is called Farm Fresh to You (the Web site for both is farmfreshtoyou.com) and delivers to 3,000 customers in the Sacramento, San Francisco, East Bay, and San Jose areas. The Barsotti brothers offset increased energy costs by doing all their own marketing, according to Thaddeus. "My parents were 1970s farmers on 20 acres," he said. "We now have 350 organic acres with 60 crops. We put our energy into marketing. We make 100 percent of our own sales, and of that, 40 percent is sold to the end-user. We have a lot of control over how much we charge." Barsotti and his three brothers are involved in some way with the farming operation. Thaddeus is in charge of production, packing and shipping. Noah handles all sales and decides what goes in the CSA boxes each week. Freeman manages the office and CSA deliveries. Che is an advisor, and not involved inday-to-day operations. Moyra, Thaddeus’ wife, is in charge of public relations and marketing for the farm and CSA, and sales to retail stores. Carol, Freeman’s wife, manages the farm’s store in San Francisco’s Ferry Building. "The energy use on our farm has not changed, nor has it drastically changed on any other farms," he said. "What has changed are the dynamics of how a product’s value is measured." Barsotti doesn’t think the science of sustainable farming practices has changed, but "the value of these practices is increasing at the same rate as the price of imported energy." "The economic advantage of a local product compared to a non-local product is also increasing," he said. "The increasing price of imported energy stings today but this discomfort will be the catalyst for the change toward a truly sustainable food system. The increasing price of fuel may be the best thing that has happened to the sustainable farming movement since my parent’s generation." Russell Lester, a fourth-generation California farmer, farms with his daughter and farm managing director Jenny Lester Moffitt and other family partners at Dixon Ridge Farms in Winters. They farm 450 acres of walnuts, and process walnuts on a total of 3,000 acres. They began farming organically in 1989 and till their soil every six or seven years. Concern about future fuel costs has driven the Dixon Ridge Farms partners to explore complete energy self-sufficiency. Agriculture is fuel-intensive and fuel-dependent, Lester notes. It can’t help but be affected by the tripling of fuel costs in the last year. "I think a 10 percent increase in fuel costs is a conservative estimate for what is coming," he said. Lester said they started looking around their farming operation at potential energy sources. "We had walnuts and walnut shells and we wanted to use them as a source of energy," he said. "Last year, I set a goal of being energy self-sufficient by the year 2012, while being carbon-neutral or negative. Another part of the goal is that this energy would come from an inedible source." In 2007, Dixon Ridge Farms began working with the Community Power Company (CPC) of Colorado. They secured a California Energy Commission grant to place CPC’s $400,000 BioMax 50 machine, which burns walnut shells for energy, at Dixon Ridge Farms. "Our system was up and running by November 2007," said Lester. "We heat the walnut shells above 2,000 degrees Fahrenheit until they ‘gasify.’ The combustible gas can then be used in our walnut dehydration system or in a gasoline generator to produce electricity." According to Lester, the BioMax 50 produces 50 KW of energy per hour, which powers a 12,000 square foot freezer that previously cost them $4-5,000/month to operate. They use the "waste" heat to heat their buildings or dry the walnuts. Previously, Dixon Ridge used about 9,000 gallons of propane a week during the month-long drying season; now they use recycled heat. Lester said the exhaust from the walnut shell-powered generator is similar to that from a propane engine. "The ‘char-ash’ from the combustion of the shells should be able to be put in the soil," Lester said. He and his daughter have been working on the carbon aspect of the project with UC Davis associate professor and ASI-affiliated faculty member Johan Six, of the plant sciences department. "We like that our system is a full-circle, closed-loop, local-loop system," Lester adds. He has plans to convert his gasoline engine to a diesel engine, using synthetic diesel or inedible walnut oil for the 15 percent liquid fuel required. The other 85 percent will come from the gas produced from walnut shells. A new module will convert some of the walnut shell gas into liquid synthetic diesel. "We will be the only commercial operation in the world to produce our liquid fuel this way," he said. The processing plant can also produce 15-20,000 gallons per year of inedible walnut oil and meal "cake" to burn. Lester and his daughter have also installed 3,500 square feet of solar panels at their main shop and hope to have as many as 100,000 square feet in two or three years. He said he began to seriously think about energy self-sufficiency when he heard politicians talking about it. "I got tired of them aiming for 20 percent self-sufficiency in 2040," he said. "By then, it’s more than likely that I’ll be dead. My company is 25 percent energy self-sufficient now. By the end of the year, we hope to be about 60 percent self-sufficient, and 100 percent in three-and-a-half years." Lester said the biggest hurdles to energy self-sufficiency at Dixon Ridge Farms have been regulatory. Walnut shells are not currently considered a renewable source of energy by the utility. He noted that Assemblymember Lois Wolk of Davis and her staff have been very helpful in steering the Dixon Ridge Farms partners through the maze of regulations. First-generation farmer Scott Park of Meridian began farming in the 1970s. In the late 1980s he made the transition to an exclusively organic production system. "The University of California and the SAFS project in particular have been the most critical source of information for me," said Park. "I hope the funding keeps rolling for sustainable agriculture research." Park said that every day farmers reconsider their crop rotations, often driven by energy use. He noted that improved soil structure is the most important factor in reducing energy use on his land. "We have found we get fuel savings with healthy soil," he said. "Our ground is pretty mellow, and we try not to disturb it with tillage. We have found that good soil fights insects, and cover crops lead to good soil in part by loosening it. I don’t need more than a 90 horsepower tractor to till it, which I don’t do much." Park planted wheat this year for several reasons. "Less tillage occurs in prepping the ground to plant wheat and there is no tillage during the season," he said. "I am incorporating the straw because the huge amount of biomass helps the following year in feeding microbes, supplying fertilizer, improving soil structure and water retention capabilities. Because the soil has such wonderful tilth, tillage is done lightly to capitalize on the healthy conditions. This helps minimize fuel consumption along with lowering irrigations and fertilizer inputs. The wheat is not baled—which you do get paid for—because I think the dollar return value of straw incorporated far exceeds the straw payment."